Joe Marinelli is the host of Powder Perspectives. Those of you have read my column over the years know that I am a big proponent of screw feeders. Screws are reliable, robust, and can handle a range of products, but most importantly will maintain a mass flow pattern if designed properly (See Photo 1 below). Most bulk solids require a mass flow pattern as funnel flow is susceptible to ratholing, erratic flow, flooding, segregation, etc. As I have always stated, in order to evaluate whether a solid is going to flow properly, measurement of its flow properties is required. Once your material's flow properties are determined, reliable bin and feeder designs can be developed. Some materials are extremely cohesive and, as such, require large openings to prevent arching. Materials that come to mind are synthetic gypsum (sometimes referred to as FGD gypsum or flue gas desulfurized gypsum), sludge, wet, heavy solids, etc. As shown in Photo 2, mass flow is definitely required to maintain reliable flow. The feeder design is critical to maintaining a mass flow pattern. If the feeder creates a preferential flow channel, the material will flow in funnel flow and destroy the required mass flow pattern. One approach that is commonly used is live bottom screws. As the name implies, the bottom (outlet) is fully live. Material discharges over the entire cross-sectional area of rather large outlets to maintain mass flow. Assuming that your hopper is designed to give you reliable mass flow, a live bottom screw feeder must be capable of maintaining the mass flow pattern and withdraw material uniformly over the entire outlet's cross-sectional area. The key to this approach is to ensure that the feeder increases in capacity in the discharge direction. Take, for example, the constant pitch, constant diameter screw shown in Photo 3. 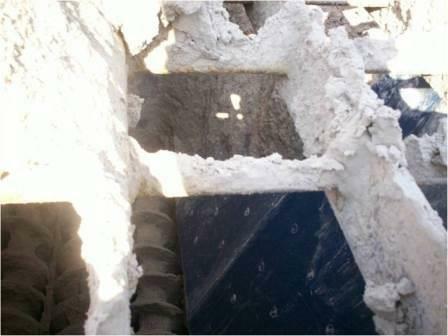 The material will be withdrawn preferentially from the back of the screw. The constant pitch flights do not allow any increase in capacity in the direction of feed. Therefore, the last flight fills with material and there is no more capacity to take material over the entire outlet length. Any modifications that you made to your hopper to ensure mass flow are now rendered useless. 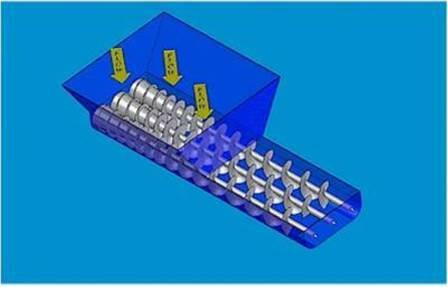 The improperly designed screw feeder creates a preferential flow channel that enforces a funnel flow pattern with its resulting problems of ratholing, erratic flow, flooding, segregation, etc. 1. Trough Shape: There is U-shaped trough to contain the screw. 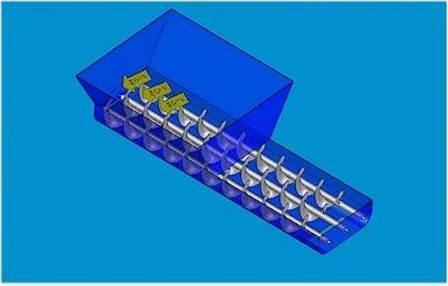 Vee-shaped troughs will not work because material usually only feeds directly above the screw diameter. A Vee-shaped trough will create stagnant material and destroy your mass flow pattern. 2. Hanger Bearings: There are no hanger bearings to support the screw. Therefore, the screw shaft has to be sized to withstand deflection. Hanger bearings will interfere with the full screw trough. Material will back up into the hopper, affecting flow. Your hanger bearings will also wear out quickly. 3. Finishes: The screw flights should be smooth while the screw trough (walls) should be rough. If they are both smooth, the material will simply spin in the trough and not convey. 4. Speed: The screw speed should be kept between 4 and 40 rpm. The screw speed should be 4 rpm on the low side to minimize speed reducer size and 40 rpm on the high side to maintain screw efficiency. 5. Clearances: There is a ½-in. clearance between the screw and screw trough. • Measure your material’s flow properties. • Design your bin for the correct flow pattern. 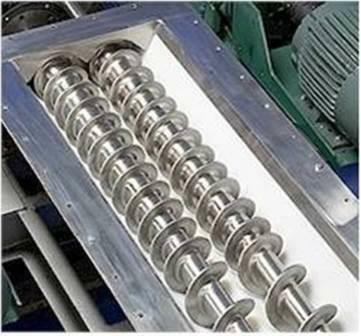 • Design your live bottom screw feeder properly, to ensure reliable flow. Find a previous Powder Perspectives column at our Powder Perspectives archive page. 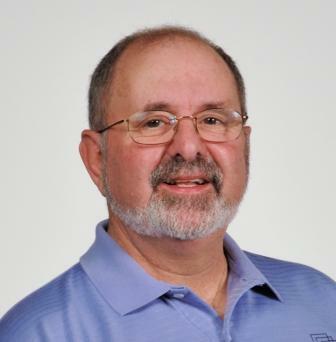 I would like to welcome everyone to the inauguration of the Powder Perspectives column on powderbulksolids.com. I look forward to hearing from anyone with suggestions, ideas, possible articles that can be published on the site (no sales pitches please). The idea is to provide practical, technical information about many topics that involve handling powders and bulk solids.